Porto Elounda Golf & Spa Resort overlooks an expanse of manicured greens, native carob and olive trees and the Bay of Mirabello and reflects its Cretan heritage in its design: whitewashed buildings with walls carved of rock and indigenous antique furnishings and folk art. 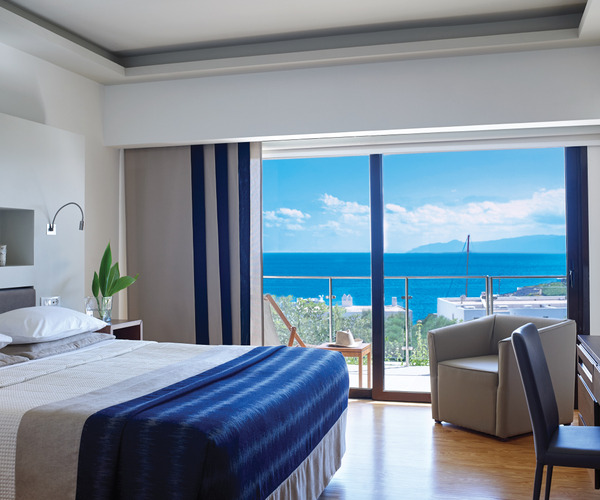 In addition to water sports, tennis, golf, and a children's program, its special offerings include a Six Senses spa that specializes in both beauty and holistic treatments; the thalassotherapy (seawater) program is a particular highlight at this location. The focal point of the Six Senses Spa is the authentic Turkish hammam, clad entirely in pink marble; the spa also has a heated indoor pool, a plunge pool, and a sauna. Among the beauty, health, and wellness services on the spa menu is a signature treatment called The Sensory Spa Journey. Along with a variation of a four-handed massage by two therapists. It includes a luxurious footbath, an aromatherapy massage, a cleansing facial, and a stress-relieving scalp massage. Its unusual sequence is meant to overcome your natural inclination to concentrate on the treatment and instead let your mind let go of stress so that you reach a deep state of calm. 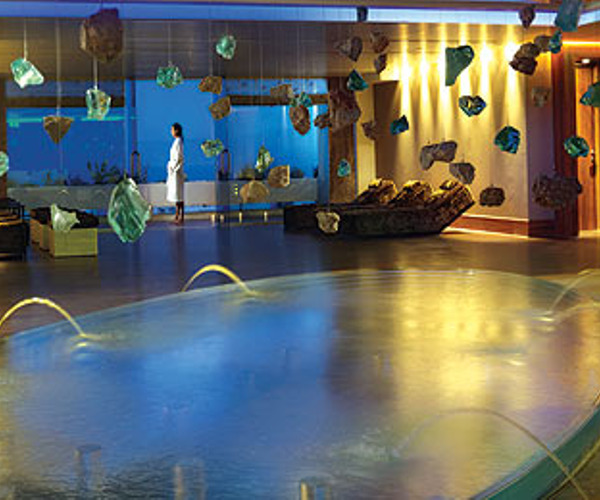 The thalasso therapies include a seaweed slimming wrap and air jet baths in seawater and oils. Among the other services offered are reiki, ear candling, Balinese massage, and a Renew Rose Anti-Age facial. The Fitness Gymnasium is designed for both aerobic and weightlifting workouts. At Porto Elounda, the water sports include water skiing, wind surfing, kayaking, canoeing, and PADI-certified scuba diving. Active travelers can also take advantage of two Astroturf tennis courts. The 9-hole, par-3 golf course is reserved exclusively for the use of guests, and an 18-hole championship course, 30 minutes away, has special rates for those staying at the resort. The Playiada, inspired by a Greek village square and covered by a wooden pergola, is the ideal location for enjoying the shade during the day or theme parties in the evening. A variety of boutiques, the art gallery, and the pro shop are all located around the Playlada. The Kid's Ark, Porto Elounda's children's program is built around the theme of an animal park. Surrounded by an olive grove, it has two shallow pools, art areas, and a kitchen, and it caters to children aged 4 months to 12 years. The resort also arranges babysitting services. In the main building are 110 rooms and 18 suites, each with a balcony or terrace facing the sea, while some have shared or private pools. All rooms & suites feature LCD flat screens, mini-bar, luxurious marble bathrooms & amenities, CD/DVD players, and wifi internet access. The Nafsika restaurant offers wonderful views of the water at breakfast and dinner. In summer, Aglio e Olio offers Italian cuisine, while the Odysseus Restaurant right on the water's edge, features seafood and Greek specialities at lunch. The Beach Bar serves drinks and snacks in the daytime, and a piano player entertains at the Kirki bar, which serves apertifs and cocktails, in the evening.